This is an unparalleled and extraordinary work in the history of piano music in many different aspects. Virtual Pianist is one solution. "Studies on Chopin's Etudes" is an unparalleled and extraordinary work in the history of piano music in many different aspects. It is so difficult to perform that there have been almost no pianists who have (been able to) perform and record it since the death of Godowsky. This has resulted in it being, for the past 70 years, regarded as a rare work, the entirety of which remains unknown and which is far from having been fairly evaluated. Twenty years after his debut recording release in 1990, Nanasakov took it upon himself to re-record this collection of works and we are delighted that he recorded the entire collection. During this 20-year period, there has been much re-evaluation of Godowsky and there have also been recordings of the whole collection by Carlo Grante and Marc-André Hamelin. However, Nanasakov’s performance which is, in a sense, completely faithful to the score, is interesting in a different way. 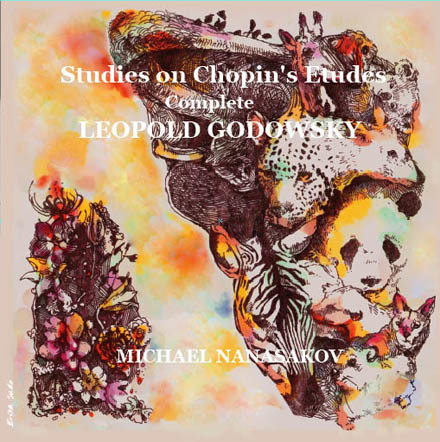 Godowsky also wrote many ossias but, with this undertaking, Nanasakov recorded multiple versions within the constraints of recording time, a consideration for which we are grateful as we are able to compare them. 11 .【No.11 】Op.10-5: G flat major / inversion, left hand, on bl. k.
33 .【No.28】 Op.25-2: F minor / b. in Oct.